Ever since I updated from VS 2010, I have lost the ability to get data tips from a datarow.item in my default Visual Basic programing environment. Just gone! I have put up with it, because what else does one do? After several searches I have found no answer. My debug life has lost a lot of quality by this apparent 'improvement'. Data tips are present as the image below shows, the issue is elswhere. The image below is a composite of 4 different screen captures of the same code stoped in debug mode for purpose of checking the variable values. The only difference is the different (highlited in red) mouse hover positions. Image part 1 and 2 show the variables with their values, this is to prove that both the datagrid.row and the findrow.row are in scope! Image part 3 shows the mouse hovering over the value of the RowG.cell and clearly shows the value of that cell. Image part 4 shows the ONLY intellisense available for the datarow which is to show the datarow, from there I can expose the item Array and see the values of all the items. However hovering the mouse over the 'item' or the '.tostring' produces no further intellisense data tip. 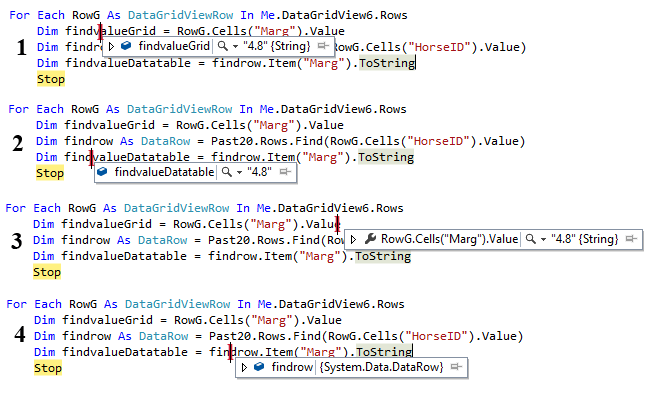 The exact same data tip available for the grid values WAS available for the datarow.item in VS 2010 and 2008 and 2005 !!!! Since 2012 version the only available intellisense is to expose the item array and go through the rows remembering what column numbers correspond with what names in order to inconveniently spot check an items value. The question is WHERE IS my datarow.item data tip hiding? Is there a specific setting I have not enabled? Or has this function dissapeared? EDIT 1: A more important question for those reading this, are you able to replicate the data tip issue for datarow.item? Even if the solution is not known to you, it would be nice to quantify if this is an issue isolated to me or few or all. Please include the VS version you are using. I have already invested several hours in this question and would really appreciate some help. EDIT 2: Test code as requested by Engerlost in comments. Paste the following code into a new Win Form project replacing Form1_Load, then run project, this will adequately show the issue. EDIT 3: Here is further prof of the issue, same code placed in a new winform app, one in VS 2010 SP1 and one in VS 2013 Update 4. Placing the cursor over the item in VS 2010 produces the data tip. In VS 2012 and 2013 this feature is MISSING and nothing is displayed. YET, as the first image shows, data tips are showing on the VS 2013 installation, for normal variables and also for a datagridview row. The problem is elsewhere! This was further supported by Engerlost in the comments. I can confirm this behaviour on VS 2010 and VS 2013. When hovering item while debugging con 2010 it displays both property info and value. Propery is on the left and value (text visualizer) on the right. Hovewer, on VS 2013 hovering over item shows nothing but hovering on row. gives the property info. Finally on both versions ShowTestColContent shows the value "Row1"
I've tried differents debug/compile options but nothing seems to be working. The images I can upload are the same as OP. Well, I think it's fixed. Cursor is where the black line is (over item). Couldn't test on 2015 Update 1 though. Finally some movement from a post on a MS blog I made a few days ago , the above IS a VS issue, undiscovered since release of VS 2012. Not the answer you're looking for? Browse other questions tagged vb.net visual-studio or ask your own question. Possible break point issue with Visual Studio 2012 RC? How to see global variables in visual studio for golang while debugging?